Situated 90 kilometres northeast of Auckland City lies Aotea (White Cloud) or as Captain James Cook decided, Great Barrier Island. At 285 square kilometres and nearly 45 kilometres long, it is the 4th biggest landmass after Stewart Island, in New Zealands main chain of islands. Standing sentinel at the edge of the outer Hauraki Gulf, Gt. Barrier protects the inner gulf and mainland from the sometimes-vicious onslaught of the Pacific Ocean. 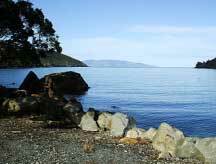 A mere 19 kilometres separates the south end of the island from the northern tip of the mainlands’ Coromandel Peninsula, and between the two, runs the Colville Channel where the tidal surge into and out of the gulf can produce notoriously dangerous boating conditions. With beautiful stretches of white sand ocean beaches on the east coast and sheltered coves and bays on the west, the whole island lies spread to the sea from its dramatic mountain ranges and majestic Mount Hobson (Hirakimata), the islands highest point at 621 metres. Along with the rest of New Zealand, Great Barrier Island gave up its bounty of natural resources to the onslaught of the European prospectors and settlers. Throughout the 1800s, copper, gold and silver mining scarred the landscape but it was the 100 years of kauri logging and milling that left the most obvious damage. Slowly but surely the native forest is replenishing itself and with island-wide concerted efforts at pest control taking place, and nearly 70% of the island under Dept. of Conservation administration, Great Barrier is at an exciting point in its history where the future of the islands flora and fauna looks bright. The same could possibly be said for the population of around 900 permanent residents that enjoy a lifestyle far removed from that of their city dwelling neighbours. With no electricity supply, no banking facilities, no supermarkets, footpaths, streetlights or public transport, they are a proudly independent and innovative community. Despite the sometimes frustrating conditions experienced when living 'off the grid' the population appears to be slowly growing again after a dramatic loss attributed to the unexpected arrival of the 'coastal real estate phenomenon' in the 1990's. Traditional employment opportunities in farming and fishing are almost a thing of the past and although only in it's early stages, more and more residents are turning to the tourism industry as a means of survival. 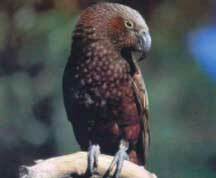 Along with the human population, Great Barrier Island is home to a wide range of endangered species. Included in the 13 different species of lizard found on the island, the Chevron Skink (Niho Taniwha) is found only on Great Barrier and Little Barrier Islands and is one of New Zealands largest and rarest lizards. Along with the North Island Kaka Parrot, Banded Rail, and the Black Petrel there are numbers of New Zealand Dotterel and Oyster Catchers and of course the Pateke or Brown Teal. This is the worlds’ 4th rarest duck and more than 600 of the 1000 or so that remain make their home on the Barriers’ wetlands and foreshores.